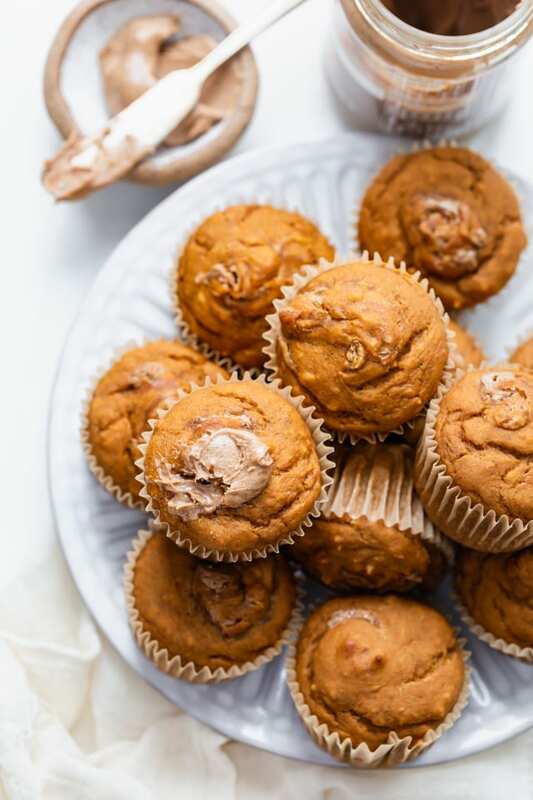 If you’re looking for a morning muffin recipe that is oil-free, low in sugar and filled with nutrition, these sweet potato muffins are the perfect treat! 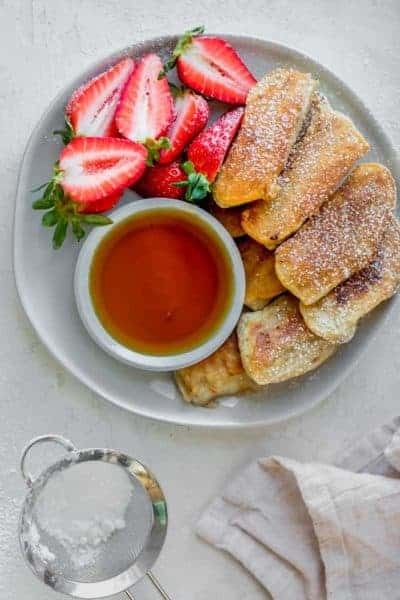 They’re vegan, easy to whip up with everyday ingredients and have a sweet and satisfying taste that kids and grown-ups alike love! 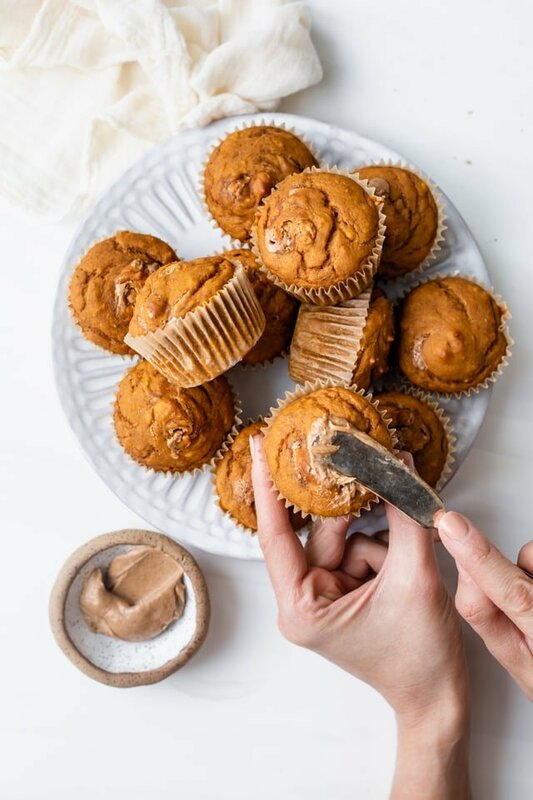 Because of the natural sweetness of the sweet potatoes, you’ll use way less sugar than most muffin recipes. And the outcome is a moist and delicious muffin you can enjoy for breakfast, snack or even dessert. 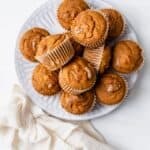 I add these healthy sweet potato muffins to my kids lunchboxes, and they are perfect for school. The first step to making sweet potato muffins is to cook the sweet potatoes. 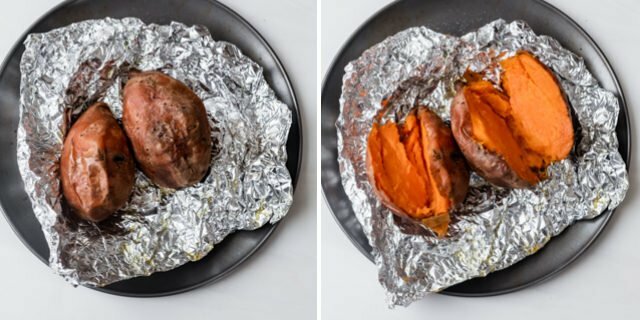 While this is a great recipe to use leftover sweet potatoes, roasting them in the oven gives a smoky sweet flavor that truly makes the recipe delicious. Roast at 425°F for 45-50 minutes. About 2 medium sweet potatoes should get you about 2 and half cups of sweet potatoes. Allow the sweet potatoes to cool, while preparing the wet ingredients in a blender and the dry ingredients in a large bowl. 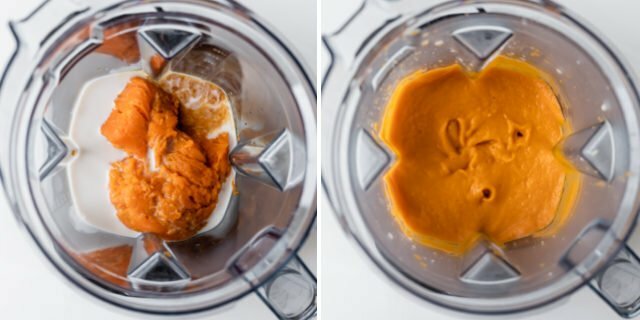 Then add the flesh of the sweet potatoes to the blender along with milk and vanilla extract, and blend until it’s well combined. You can do this with a whisk or handheld mixer. But the blender does the job so efficiently! Now you’ll want to pour the wet mixture over the dry mixture and mix until well combined. It’s ok if it’s a little clumpy, but make sure there are no more streaks of flour left. Transfer to a muffin pan…wait ever so patiently…test the muffins…maybe wait again a little more patiently and there you have it – healthy sweet potato muffins made [patiently] by YOU! I don’t bake much, so I tend to celebrate the results dramatically when I do. Hey, you should too! There’s some magic that happens in that oven. Chocolate: chips, chunks, nibs…you name it! Cool the muffins in the pan for a few minutes. Then transfer them to a wire wrack and cool them completely. Then you’ll want to place the muffins in an airtight container. But it’s important to add a paper towel under the muffins to absorb any moisture that they release. This helps keep them fresher longer. And you won’t get any soggy muffins on day 2 of enjoying these goodies! For freezer storage, add the muffins to a resealable freezer bag and store in the freezer for up to 3 months. To thaw, place on the countertop and allow them to come to room temperature. You can then warm them in the microwave or oven for a couple minutes before enjoying. Roast the sweet potatoes ahead of time. While this is a super quick recipe, roasting the sweet potatoes is the most time consuming part. I roast it at 425°F for 45-50 minutes. Then allow it to cool so it’s easier to handle. This is great to do when you have other food in the oven. Don’t overmix the batter. Just mix until you don’t see any more flour streaks. If you overmix the batter, the muffins may bake unevenly or become extra chewy and tough. Customize with add-ins. Feel free to fold in chocolate, chopped nuts or fruit after you’ve mixed the wet ingredients with the dry ingredients. Allow muffins to cool before removing from pan. It’s tempting, I know. But when you give it time, the steam that condenses around the muffins actually makes it easier to remove from pan. And then don’t forgot to cool them on the wire rack for a total of 15-20 minutes. I love how easy these muffins are to make and how healthy and delicious they are! It’s a vegan recipe without any hard-to-find ingredients. In fact, it’s mostly ingredients you probably have in your pantry. 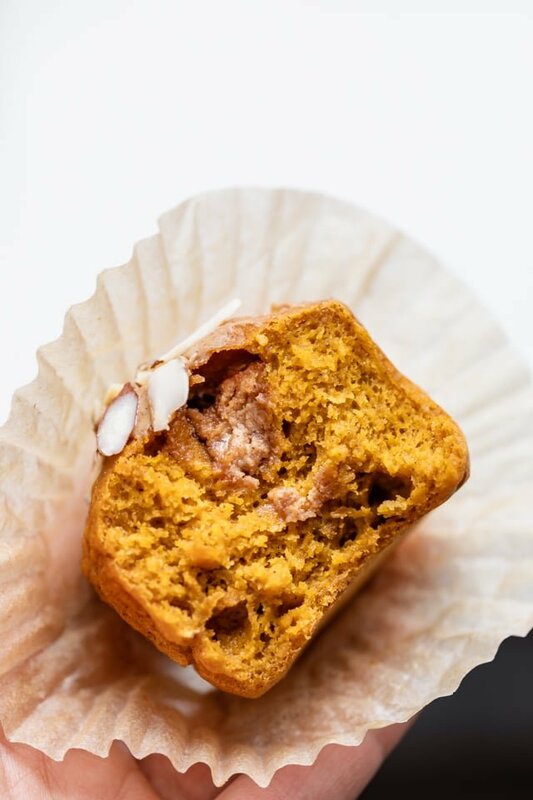 And the result is a super moist and nutritious sweet potato muffins recipe that everyone will love! 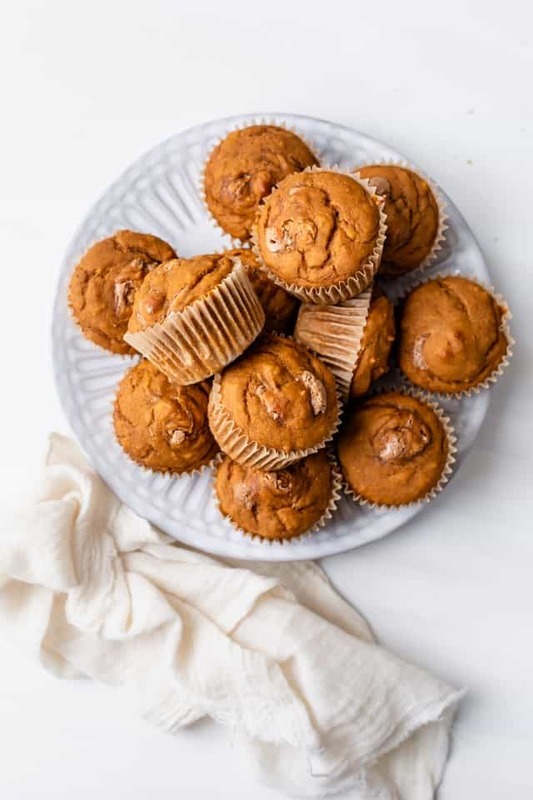 If you’ve tried this healthy-ish feel good Sweet Potato Muffins recipe or any other recipe on FeelGoodFoodie, then don’t forget to rate the recipe and leave me a comment below! I would love to hear about your experience making it. And if you snapped some shots of it, share it with me on Instagram so I can repost on my stories! 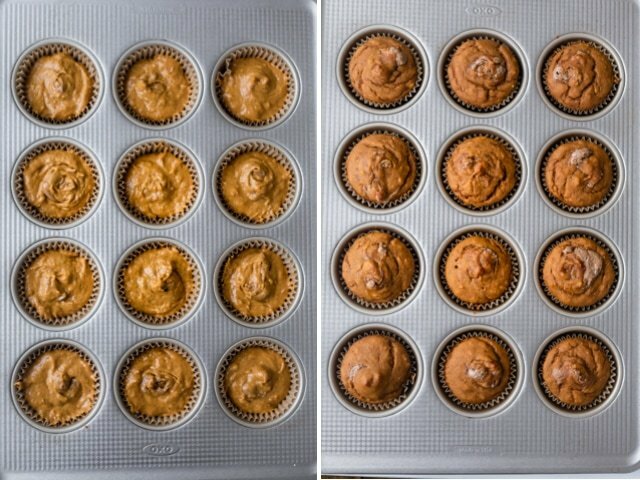 Preheat the oven to 350°F and add muffin liners to a muffin tin. Place the cooked sweet potatoes with the coconut milk and vanilla extract in a blender and blend until smooth and consistent. In a large bowl, combine the flour, sugar, baking powder, cinnamon, and salt. 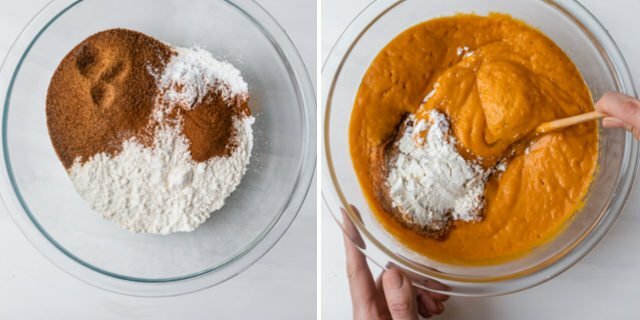 Transfer the sweet potato mixture from the blender to the bowl of dry ingredients. Stir with a wooden spoon until combined. Spoon batter into muffin tins until filled to the top. Then add a teaspoon of almond butter onto the center of each muffin and gently swirl around with a toothpick or knife. Bake in the preheated oven for 25-30 minutes, or until a toothpick inserted inside comes out clean. Let them cool down for 15-20 minutes before cutting them open. Storage: Store any leftovers in an airtight container with a paper towel under them to absorb any moisture. They will last about 4-5 days in the fridge. You can also freeze the muffins for up to 3 months. I would not recommend using yams instead of sweet potatoes. They have more starch than sweet potatoes so they won't lend enough moisture to the recipe as sweet potatoes do. Instead of coconut milk, you can use any other plant-based milk or regular milk. I tested this recipe with a whole wheat white flour, but it will work with any other all purpose flours. To make this gluten-free, use an all-purpose gluten-free flour mix. Do not substitute only almond flour or only coconut flour. Equipment: I mixed the wet batter in my Vitamix. It has a "smoothie" button that pulverizes the cooked sweet potato without any chunks of it leftover. You can also do this with a handheld mixer or food processor. It will work with a standard whisk, but may take a while to make it smooth. Nutrition: Please note that the nutrition label provided is an estimate based on an online nutrition calculator. It will vary based on the specific ingredients you use. This information should not be considered a substitute for a professional nutritionist’s advice. The nutrition value is for one serving without the almond butter topping. 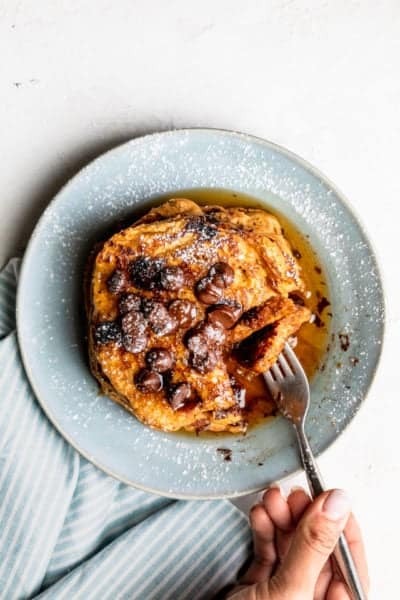 Can I use almond or oat flour? If yes, how much? I would not recommend substituting just almond flour or oat flour. But if you find a gluten-free mix that is meant for all-purpose flour substitute, that will work well! Delicious. Made a batch following your recipe. Can’t have one & stop. Thanks for another great healthy recipe.